In Reena’s world, sounds scattered and scrambled and made no sense. But her clear blue eyes saw everything. She saw the scruffy brown dog with drooping ears who hid in the shadows of the park. Reena is hearing impaired. She loves to play with the other children who come to the park but sometimes she is left behind because she doesn’t hear what is happening. Dog is homeless. He loves to watch and to play, but he doesn’t have a person or place of his own. But when the two pair up, each findsa new sense of belonging. Reena’s Rainbow is a touching story of friendship and belonging. The pairing of girl and dog is heart warming, and the message about acceptance is important. The gentle soft-toned illustrations are a perfect complement to the gentlessness of the story. ‘What kind of animal are you?’ they asked Paddy. ‘I’m Paddy O’Melon and I’m an Irish kangaroo,’ he proudly explained. ‘Really?’ said Keiran, and the gang of animals giggled. Paddy wondered why they thought this was funny. It’s an exciting day for the young joey: his first day out of his mother’s pouch. But when he and his mother are separated, the day becomes a bit too exciting, for all the wrong reasons. Luckily he is rescued by an Irish family who live near the forest and rescue orphaned and injured animals. they look after the joey, who they all Paddy, and Paddy is safe, but he really isn’t sure what kind of animal he is or where he belongs. The humans say he’s an Irish kangaroo, so he figures that’s right – until he is put straight, and eventually returned safely back to his mother. Paddy O’Melon The Irish Kangaroo is an entertaining and educational picture book, which, as well as being the story of one young pedemelon’s separation from his mother, also gently shares the importance of protecting wildlife from dogs and other dangers and, through back-of-book notes, educates about the rainforest flora and fauna. The book’s author had a passion for Australian wildlife before her early death, and the book has been posthumously published to share her passion. Illustrations, in watercolour and pen, are realistic in style with beautiful renderings of the various animals. Suitable for solo reading and educational settings. His grandma knew he loved them, so she sent him a treasure map. Ollie loves treasure hunts and he’s very excited when his grandma, Gran, sends him a treasure map. Ollie happily speculates on what the treasure might be. Each clue has him moving closer to the ‘happiness always’ treasure that Gran promises. He follows her instructions to the letter, relishing each activity. Finally he reaches the treasure. It is nothing he had imagined. It takes Gran’s final instruction to help him understand and appreciate this treasure. Illustrations are loose black line and goache, mostly set in white space. ‘Ollie’s Treasure’ has a clear purpose: to model mindfulness in young children. Ollie clearly has a strong relationship with Gran, but he also clearly has very strong ideas about what a treasure is. Gran uses his love of treasure hunts to point out the wonder in the world he inhabits. Although Ollie enjoys the task, it is the potential reward that drives him forward. His disappointment when the treasure is revealed is ameliorated by Gran’s ‘unpacking’ of the real, and lifelong, treasure he can enjoy. Together they share happiness. Illustrations clearly depict Ollie’s emotions. Recommended for pre- and early-schoolers. I sat on the broken front step of the ‘new’ house. New town, new school … nothing was the same. When she first sees her ‘new’ house, a young girl sees nothing but ‘old’ – drooping roof, peeling paint, a crumbling step, and cracks everywhere. She is not impressed. She does not like change. At all. She plods off to her first week of school. But after the first week, she notices a tiny change to her house. As the weeks past, the house continues to change – and so does her movement, until, finally, she skips towards her new home. Through the Gate is a clever, feel-good book about coping with change and, particularly, moving home. Visually, the transformation of the house from a tumble down cottage with a broken picket fence, to a beautifully restored house, with fence and garden, is clever. The use of colour – with early illustrations showing all but the girl in grey scale, and colour being added progressively as the house changes – highlights the girl’s changing attitude as she finds pleasure in her new life, and adapts to the changes. A wonderful story of resilience. My dad can fix anything. Dad can fix anything. He’s handy with a hammer and nails, sticky tape and glue and even with making peach tea and cupcakes. But when mum dies, Dad and daughter find that sticky tape and super glue are not enough – they need a special kind of fix-it, in the form of love. The Fix-It man is a heart warming story of the bond between a father and young daughter, exploring the impact of the loss of a parent in a gentle manner. It is dad who keeps the house running while Mum is sick, with gentle humour and persistence, but it is the daughter who, in the midst of her own grief, reaches out to Dad. Together they start to put their lives back together, surrounded with gentle reminders of Mum. This is a difficult topic for a children’s book – which is why it is so important. Powell’s text gives just enough detail, without over explaining or analysing what is happening, and Johnston’s illustrations are gently whimsical. A grey scale illustration at the darkest point of the book is particularly poignant, with no need for text to show how the pair cope with their loss. A wonderful book for exploring themes of bereavement. I love our dog Benji. Sometimes I think I’d like to be more like him. A small, unnamed boy shares the adventures of his loved dog, Benji. Benji eats everything, makes friends with everyone, explores. Through his dog’s antics, the boy explores his own world and his place in it. Illustrations depict both real and imagined Benji-ness. Our Dog Benji is a smaller format hardback picture book with full colour pages and end papers detailing some of Benji’s favourite things. Children learn a lot from observing what happens around them, and for the small child, that can often be a pet. Their adoption of what they see may not always be discriminating, but it can help them navigate their lives. Benji is a lovable, loving and loved dog. He is friend, companion, teacher and challenger to the viewpoint character. There is plenty here – particularly for a quiet observer-child – to support learning and living well. Recommended for early school years. Oh no! Sarah thought. She knew where all the odd socks were, but she didn’t want her mother to find them. Sarah’s mother – like almost every mother – is puzzled by the number of odd socks in the washing basket. She decides it’s time to go searching for all the missing socks. But Sarah is worried. She knows that the socks are being used by fairies – as sleeping bags, parachutes, tow ropes, toys and more. She doesn’t want her mother to find the socks – or the fairies. 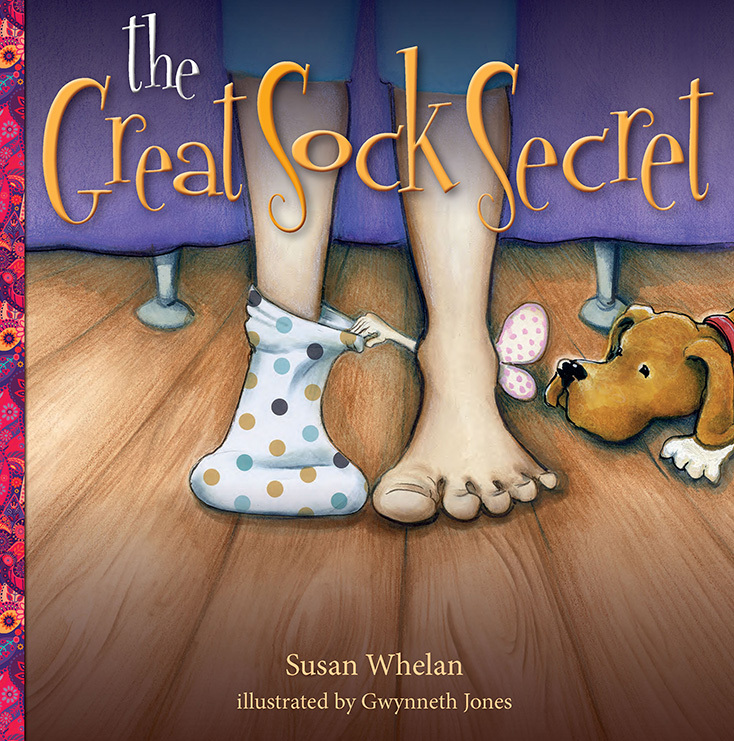 The Great Sock Secret is a gently humorous take on one of life’s great mysteries – where all the odd socks go. Young fairy fans will love spotting the fairies that Sarah knows about but her mother is oblivious to, behind the furniture, under beds, in cupboards and, sometimes, in plain sight. Illustrations are bright and semi-realisitic, with each fairy unique. And the little girl would laugh and clap her hands and dance with the ballerina. A music box ballerina likes nothing more than to dance to the music with the little girl who owns the music box. But the girls grows up, and develops other interests, and one day she stops dancing. The ballerina tries to find someone – or something – else to dance with her, but without luck. For years she is silent, shut in her box with nobody to dance with. Then, a little girl very similar to the one from years before, discovers her, and the ballerina dances one more. Dance with Me is a delightful, slightly sad, story of growing up, and the toys that are left behind. Happily, in this story, the dancer survives until the next generation of owner falls in love with her. The illustrations, by Gwynneth Jones, use watercolour and outlines with soft pastel colours for the ballerina and her world, and bolder colours when she ventures out into the world looking for a dance partner. Likely to appeal to young dancers, especially those with a fondness for music boxes. Sometimes – A lot of sometimes – I want to smile. Smile/Cry is a ‘flip’ book. ‘Smile’ is read from the front, and offers different kinds of smiles that appear on the faces of three childlike characters: a rabbit, a cat and a pig. Flip the book and ‘Cry’ details the trio experiencing sadness of different sorts as they traverse their day/week/friendship. ‘Smile’ and ‘Cry’ meet in the middle with a double page spread that envelops the reader in a big hug full of smiles and tears simultaneously. Illustrations are pencil and watercolour and help the reader to recognise emotions. The ‘Smile’ cover is bright sunshine-y yellow and the ‘Cry’ cover is in more muted tones. Smile/Cry has a sticker on the front advertising that it is a ‘A Beginner’s Book of Feelings’. (It also suggests which side to start reading). It’s also a story about friendship and play. It offers the opportunity to talk about how each individual feels and about how their feelings can affect how they relate to others. It’s easy to imagine young readers emulating both the activities and the response depicted. Recommended for preschoolers and early schoolers.